AgFed Credit Union Foundation was established in honor of Preston A. Davis, Sr.
To honor Mr. Davis’ lifelong commitment to AgFed Credit Union, and his community, the Foundation hopes to continue supporting his passion by providing financial support to varies causes. Biography of Preston A. Davis, Sr.
On December 7, 2014, AgFed Credit Union lost one of its longest serving Board members, Preston A. Davis, Sr.
Mr. Davis brought his passion to serve those who needed it most in his role as a Board member since 1978. Mr. Davis’ experiences are vast and impressive having served his country during WWII, the Korean, and Vietnam Wars. He began his military career as a Private with the Tuskegee Airman in World War II and later fought in the push from Normandy through France. 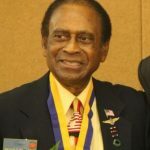 Among Mr. Davis’s many awards, the unit Medal of Honor for the Tuskegee Airmen, which he received from President George W. Bush, is most notable. He was a recipient of the Purple Heart after being wounded in battle in Korea. Lieutenant Colonel Preston Davis retired from the U.S. Army with over 25 combat medals and ribbons. Mr. Davis continued to serve his country in the Federal Government as the Director of Small & Disadvantaged Business Utilization at U.S.D.A. and many other assignments. In his down time, he navigated retirement as a member of many professional and service organizations. Amongst them was Kiwanis International. With a group of friends, he joined and integrated the Kiwanis Club of Capitol Hill. He would go on to become a Distinguished Club President, Lt. Governor of Division 1, the first African American Governor of the Capital District, Kiwanis International Foundation Trustee and the inaugural Young Children: Priority One Kiwanis International Chair. Prior to his passing, Mr. Davis initiated the AgFed Credit Union Foundation in the hopes of continuing his legacy. The Foundation was created with the philosophy of people helping people. AgFed Credit Union Foundation is fully committed to ensure that the vision and passion of Mr. Davis will remain the core of the Foundation’s philosophy.